This was my fifth and final exam for MCITP: EA. This one covers Windows 7 configuration. It was pretty straight forward, after all of the other Windows tests I’ve been passing, this one was pretty easy. I studied for 2 weeks. This test covers a broad range of topics, pretty much a review of the 3 core tests. It’s recommended that you pass the three core tests first, and then take this test. I should have listened. I didn’t do it that way. I’ve taken this twice before, once at the beginning of April 2010, and again about a month later. If you want to know what this test is like, read those posts. I’m glad to have passed 070-640 the first time. I spent two months on this one. I read the book. I actually did all the labs in the book using virtual machines. I did additional practice on real machines at work. I took 2 practice exams a day, pretty much every day, for over a month, like probably 80? total practice exam attempts. (I have MeasureUp exams that came with the book, and I bought Kaplan SelfTest exams as well. I’d say that if you are like me, that 2 months per exam is about what it takes, and that’s studying an hour or two a day, most days of the week. This was my second try at 070-643, and I passed! Yay! I was beginning to doubt my super-powers. What was different? I went slower. Read the book again. Took the practice tests over and over again until I was blue in the face. Actually fiddled with some of the technology on my own. Not much different, actually. I didn’t pass. I’ve never had such issues with any other exams before. These Microsoft tests are tough! Studying the official Microsoft Press books, and taking practice tests from the official Microsoft recommended practice test vendors is apparently not enough. I read the book for this exam multiple times. I painstakingly did all the labs. This book does not cover test topics to the same depth and detail as you see them in the test. I took the practice tests over and over again until I had all the questions memorized and repeatedly got perfect scores on them. The actual test is unfortunately not a whole lot like the practice exams. Oh well, Microsoft has their Second Shot program going right now, so retakes are free. The program expires at the end of June 2010, so I will have to do the retakes soon. I took 070-647 Windows Server 2008, Enterprise Administrator exam again today. I didn’t pass again. I got the exact same score, 653 out of 700. Like I said in my previous post on 070-647, these MCITP:EA exams are some of the hardest exams I’ve ever taken. I’ve taken a lot, from a lot of different vendors. I took 070-642 today. I passed! Like I said before, these MCITP:EA exams are tough. I have a lot of experience with TCP/IP on various operating systems, so this exam was a little easier for me. I try to keep my certifications fresh. I am MCSA on Windows Server 2000. I failed to upgrade to Windows Server 2003. (There was a test for that, but it is no longer given.) So I have to start all over. 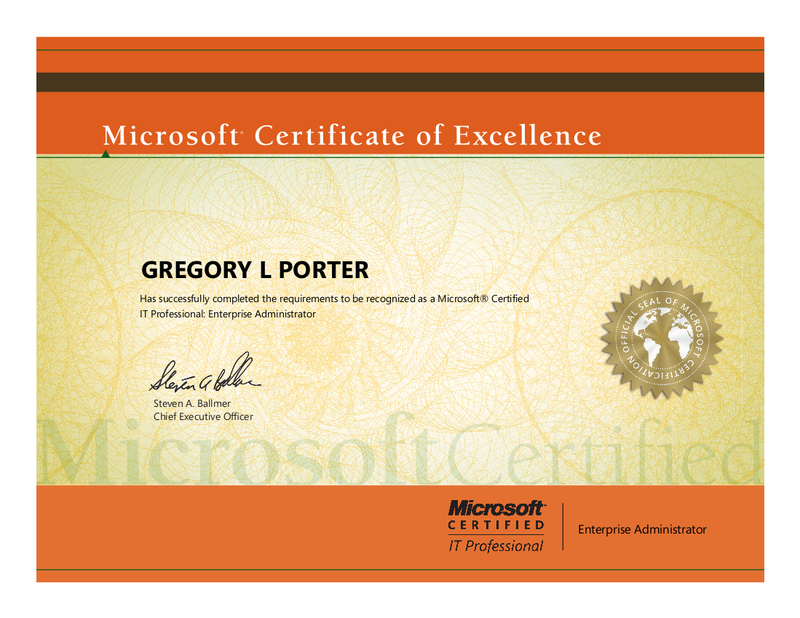 The replacements for MCSA/MCSE are the “Microsoft Certified IT Professional” AKA MCITP. The replacement for MCSA is MCITP: Server Administrator and the replacement for MCSE is MCITP: Enterprise Administrator. The best thing one can do in my humble opinion is to actually use the product you’re taking the test on, and actually go to classroom training. Unlike some vendors, Microsoft only offers training through third party vendors. Most places have suitable training nearby. Unfortunately, the classroom training is very expensive. Most of these classes are 5 days (one week.) The prices vary, but they run something like $500 per day, something like $2500 a week. Plus travel, lodging, meals, etc. 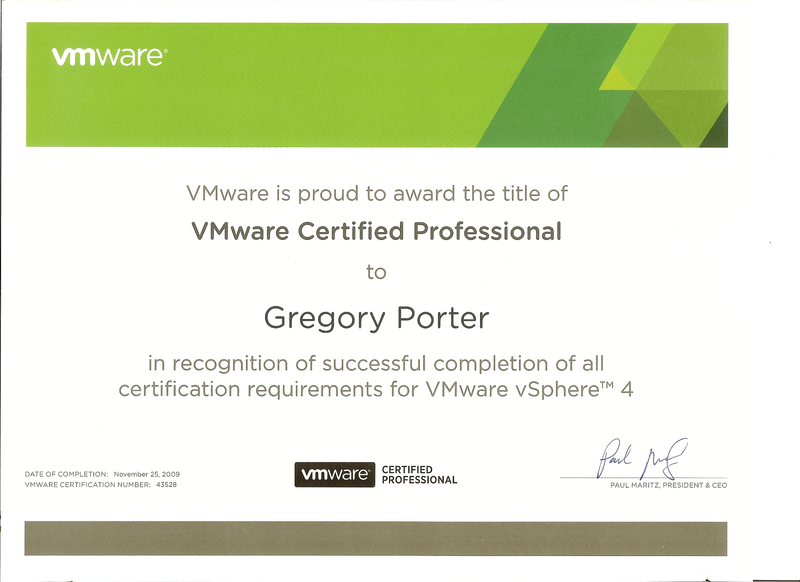 I’m VMware Certified on vSphere! I passed the VCP4 test on Nov 25th, 2009. 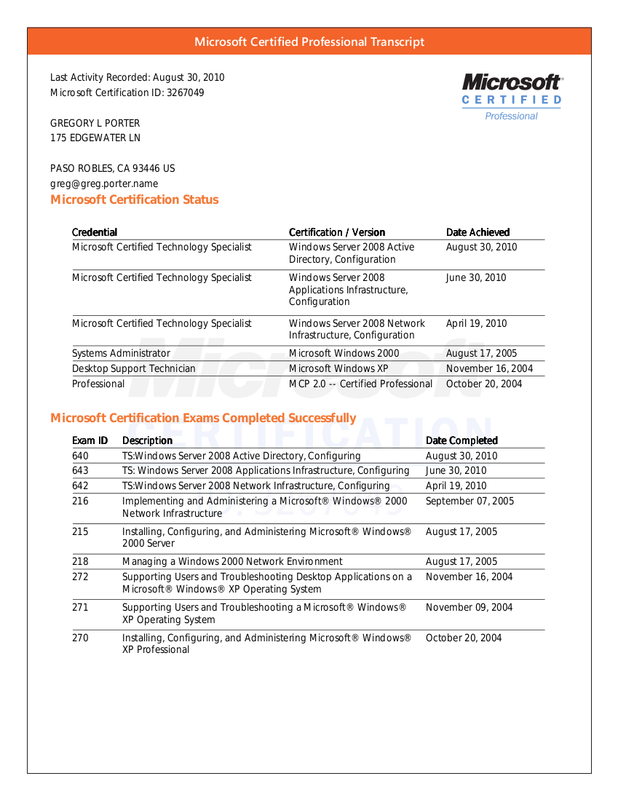 I didn’t actually get the VMware certification packet with my certificate until Jan 7, 2010, five weeks later. 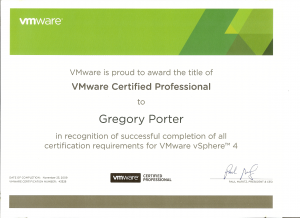 See my post on what the VCP4 test was like if you’re interested. I’m VMware Certified on VI3! 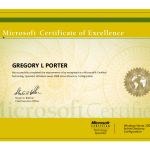 I passed the test on Oct 5th, 2009. 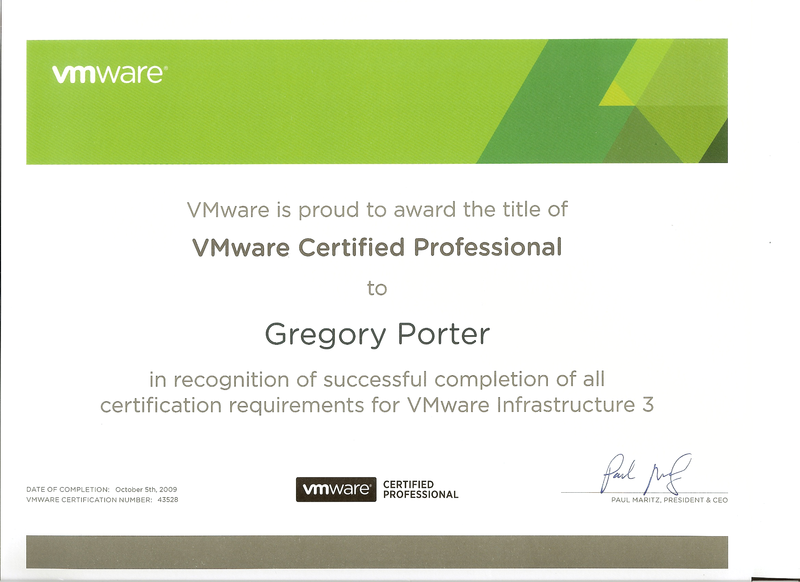 I didn’t actually get the VMware certification packet with my certificate until Jan 5, 2010, three months later. See my post on what the test was like if you’re interested.